Reliability and maintenance leaders need timely, accurate plant-wide metrics to drive operational excellence. Even high-performing facilities are at risk from equipment breakdowns from ineffective maintenance scheduling. For leaders with a focus on reliability, getting instant visibility on real-time maintenance data can be the difference between helping their business thrive versus survive in complex, fast-moving facilities. Is your maintenance data inaccurate, or simply unavailable? Maintaining equipment is expensive ... but breakdowns can be significantly costlier. Without data you can trust, it’s impossible to make the right, timely decisions to control maintenance expenses without compromising production. Is the data you need in different systems? Is data integrity comprised when staff modify spreadsheets? How can you keep your maintenance teams productive? Get Real-Time KPIs with Sockeye! Sockeye’s dashboard features SMRP-recommended metrics to track maintenance efficacy facility-wide. With real-time KPIs, you can achieve world-class maintenance for a highly reliable facility. Tighter scheduling adherence and better preventive maintenance result in fewer breakdowns, shorter shutdowns, reduced lost time accidents. Sockeye delivers better visibility across facilities in real-time. 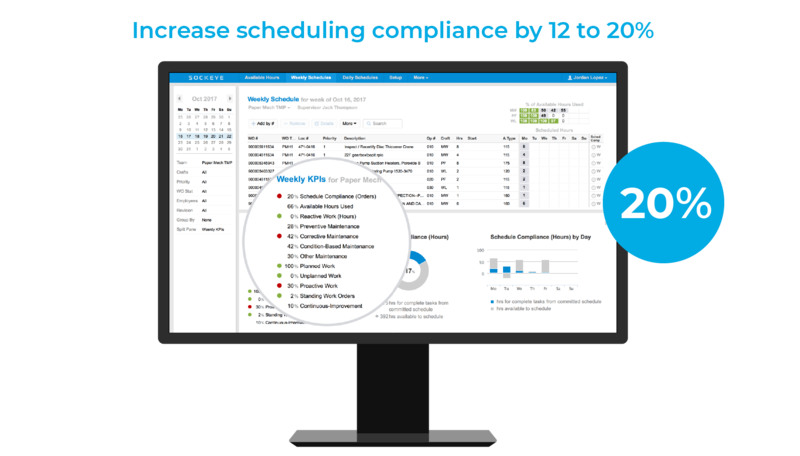 With Sockeye, maintenance scheduling best practices can be applied consistently across all facilities. More planned maintenance is completed, decreasing reactive work by up by to 20% for greater reliability and safety. Instant visibility, quicker decisions, better maintenance, and improved communication with Sockeye empowers reliability and maintenance leaders to achieve maintenance excellence.